Well, Rick Perry pulled the plug today on the iron lung keeping his candidacy alive. Pity. We could have used the money for a new wetbar. Oh well, there’s always 2020. But John Kasich is still in the hunt, so let’s take a crack at him! Here we have yet another decent attempt at logofication that yet again looks like a fashion advertisement. 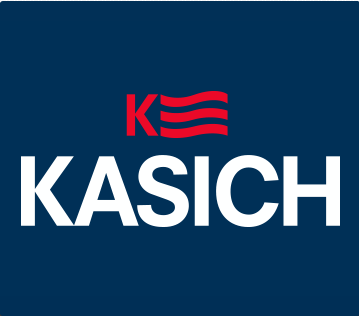 This is the current Kasich brand, a slightly trendier change from his initial attempt. [See below.] I don’t know what this typeface is but it looks like someone knuckle-punched Helvetica in the bicep and made it flinch. Look, if you’re going for Prince of Snoozetown, just use Helvetica and leave the knockoffs alone? As for that logo. Press K; rub hands gently under warm air. Or is it Kasich Farms Bacon? Or some kind of rewind button on an editing machine? That backwards pointing arrow in the negative space isn’t helping your forward momentum, John. Folks, we know designers bemoan the stars and stripes and other Americana that loiters all over political signage, but there’s a reason it’s there. It clarifies that the product is a candidate for public office and not some new brand of sneakers. Trite? Yes. Overused? Yes. Necessary? Sometimes. The trick is to make it interesting. We can’t believe it’s not better. 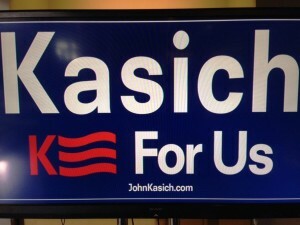 This is what Camp Kasich rolled out with their candidacy announcement. Same bacony logo, same uninspiring typeface and half a slogan. For us. Well, who are us? Is Kasich only for us inclusively? Or can we join too? If we join, does that make us us, or are we more like step-children? This is like one of those endless, avuncular tales that Kasich uses to avoid answering questions during interviews. It makes you smile politely but at the end of the day you’re left mildly bewildered as to what it’s all about. Now this one wasn’t easy. We tried to stick with the K-Bacon concept, but it contains inherent problems, the most glaring of which is that no matter how you move it around, it still looks like bacon. First, we beefed up the wimpy stripes and removed that backwards arrow. Nope. Still bacon. But really thick bacon. Voor ons. Voor Nederland… huh? Oh, right! We thought going red white and blue in the stripe would help but honestly it only tested well with the Dutch. And while the arrow is gone the K and A are jostling for position in the negative space. Bad. So we wadded all these concepts up into a puck and played a few rounds of office hockey. [Really, we weren’t even supposed to be here today!] Unfortunately, the cat stole the puck in the second period and we had sit down and try this again. This is it! Except for the clutter. And lack of balance. And a few other things. Boom. Mic drop. It’s not a simple logo, like K-bacon, but neither is it a confusing logo, like K-bacon. It has a trendy, quirky boldness, yet retains a stoic sense of past campaigns. What’s most important is that it’s more recognizable, more direct and more understandable at a glance, which is about all the time you have to catch someone’s eye at this stage of the game! We’ve switched the Perry hotline with a direct link to your campaign manager, John, all he’s got to do is pick up the line!